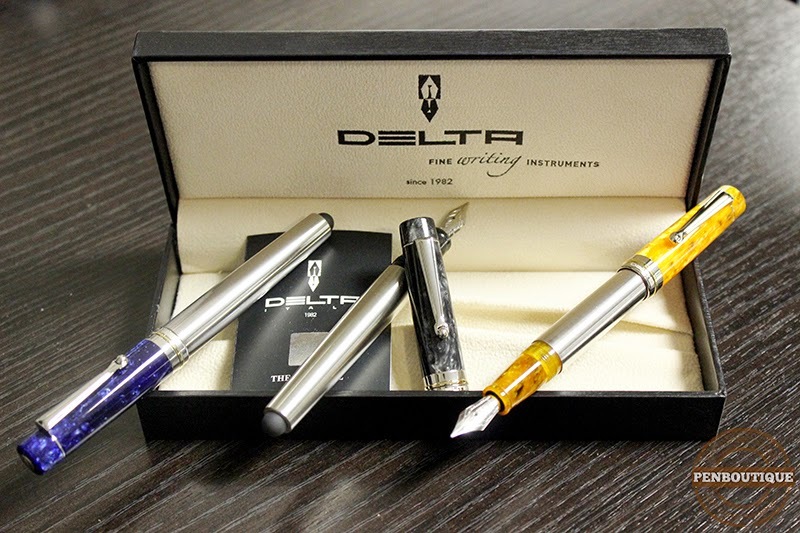 Combining classic looks with modern technology, Italian brand Delta introduced the Vintage Stylus to its lineup. The cap and front section are crafted from a marbleized resin, while the body is constructed from a brushed stainless steel. At the rear of the pen you find a stylus which can be used with your smart phone, tablet, or anything else that has a capacitive touch screen. The stylus is becoming more and more prevalent in the marketplace, though it does seem that most luxury brands are slow to integrate the technology. The Delta Vintage Stylus gives fountain pen users (and rollerball users) the ability to use their beloved writing instrument with their favorite piece of technology. Delta’s signature roller clip, designed with a wheel to help when placing the pen in a pocket, is an immediate clue to the pen’s lineage. The fountain pen uses international size cartridges only. The flexible iridium nib is available in Extra Fine, Fine, Medium or Broad. The pen can be had in Lava Black, Burnt Orange or Deep Ocean Blue. At 4 5/8 inches long uncapped, including the stylus, this is a small pen. Posting brings the total length to a hair over 5 5/8 inches. This short length explains why a converter is not an available option. I find that the pen feels more balanced with the cap left off. The front section allows a good purchase without having to clamp down. The iridium nib gives a nice, smooth writing experience. I did notice that just a slight amount of pressure was sometimes needed to get the nib flowing, but writing was effortless once started. The stylus worked perfectly with my smart phone. With the lightest touch I was swiping between menus and typing out texts. It was also very precise – I was able to place the cursor between the exact letters I wanted to 9 out of 10 times (not something that always happens when I use my finger). One thing I really appreciate about the stylus on this piece is that it is replaceable. If any damage were to occur, you simply unscrew the stylus from the body and replace it with a new piece. I would consider this a feature unto itself! The Delta Vintage Stylus was a pleasant surprise. It is a little short, a little light and cannot use a converter – but it is a good looking, smooth writing, multi-use fountain pen. It easily slips into a dress shirt pocket, giving you a sophisticated look without breaking the bank. With this line, Delta has successfully bridged the gap between old style and new technology. If you’re in the market for a new pen, give consideration to the Vintage Stylus!